« Innovation Awards Step 2. What is making the cut? In an attempt to bring you closer to the Jury and the Awards process, we asked some of our Jury members to share their opinions and insight around specifics aspects of Innovation in India. Ms. Anu Aga, Mr Nadir Godrej and Professor Ashok Jhunjhunwala took the time to answer some questions and shed some light on the different areas that demand innovation in India. Learn more about rest of the 2012 Innovation for India Award Jury. The Marico Innovation Foundation plays the role of a catalyst for innovation in India and works toward building a rich, inclusive innovation ecosystem. We asked our Jury for their perspective on the role of the Government, the Private Sector and the Social sector in building this ecosystem? Prof Jhunjhunwala renowned Professor from IIT Madras focused on the start-up ecosystem in his response. “(We) Need more government funding at start-up level. Need policy and incentives to try out indigenous products when they are available, rather than insist on established imported products”. Prof Jhunjhunwala is also a serial entrepreneur who has founded seven companies centered on new technology and innovations in existing technology. Creating a significant social impact in India often requires innovation and with this idea in mind we asked the Jury to describe a few of the major social impact areas that demand innovation solutions. Education, green energy and inclusive growth are some of the big issues that came up. “India’s biggest problem is uneven economic growth today.” remarked Prof. Jhunjhunwala. “Innovation has to focus on this. Indian society has a large number of challenges – that means more potential for innovation”. Through IIT Madras he is working toward building formal and informal environments for industry persons, academia and young people to come together, innovate and ideate. “Green energy is an important issue for the planet while education and inclusive growth is critical for India.” said Mr. Nadir Godrej, Chairman, Godrej Agrovet and the Managing Director of Godrej Industries. He is an Indian innovation enthusiast, and Godrej has a strong focus on green practices which are critical for its continuous growth and development as a leading FMCG. Mr Godrej was clear that social organizations need to innovate to use fewer resources and meet their specific goals while businesses need to innovate and target the bottom of the pyramid; strive to be commercially successful as well as meet societal needs. Ms. Aga highlighted literacy and skill development as the two main areas that she believes demand social innovation in India. Following several years of Business Leadership, Ms. Aga is now deeply involved in social impact projects. 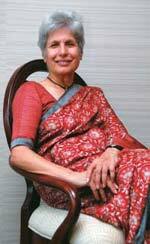 She is currently a trustee at the Akanksha Foundation as well as a Board member of the Women’s India Trust and Commonwealth Human Rights Initiative. Ms. Aga shares that “Development for the millions of our young people to help them to be gainfully employed and productive for the overall benefit of society” will need to be a key focus. This will require two key elements. The creation of adequate employment opportunities in various sectors of a growing economy to absorb the skilled workforce. And a decentralised machinery to combat corruption at grass root levels and to ensure that development funds reach the desired beneficiaries. Innovation continues to be underlined as a key ingredient for India’s growth and development. It is this insight that fuels the Marico Innovation Foundation and sets the bar high for each Innovation for India Award. Stay tuned to this blog for more insights and interviews from our Jury. We hope this gives you a better understanding of the foundation’s mission and makes the award process and selection more transparent. Find out more about how the Marico Innovation Foundation is directly supporting Social Innovation. The awards are just 2 months away and we will be reserving a portion of the seats for the public to attend and be a part of the ceremony. If you are interested in attending, stay tuned to our Facebook page and Twitter handle for updates. This entry was posted on January 18, 2012, 3:45 AM and is filed under Featured. You can follow any responses to this entry through RSS 2.0. You can leave a response, or trackback from your own site.